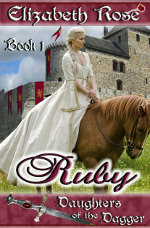 For this week’s Medieval Romance Monday we are featuring Ruby by Elizabeth Rose. Ruby is Book 1 in the exciting new Daughters of the Dagger series. Ruby de Burgh is the first born of the four daughters of Earl Blackpool. They were all named after the stones in daggers, bought by their late mother regarding a superstition. Ruby acts more like the son her father always wanted, and nothing like a lady. And she is not pleased to find out her father has promised Lord Sheffield his choice of one of his daughter’s hands in marriage. Lord Nyle of Sheffield needs a wife so he can carry on his secret mission for the king. However, after losing three wives in a matter of months, he is sure their deaths were not accidents as it seemed, but rather they were murdered. Now to catch the murderer that he believes to be inside his castle walls, he chooses a wife as bait who he knows can wield a sword and hold her own against any attacker. Will murder and mayhem place a wedge between an unconventional wife and the Lord of Death, or bring them closer together as emotions are brought to the surface in Ruby – Book 1 of Daughters of the Dagger? Remember to read the Free Prequel first! This entry was posted in Blogs and tagged elizabeth rose, medieval romance monday. Bookmark the permalink.